May 24, 2018, 9:50 a.m.
By Laura Hazard Owen @laurahazardowen May 24, 2018, 9:50 a.m. I admit to watching these videos after linking to them here. 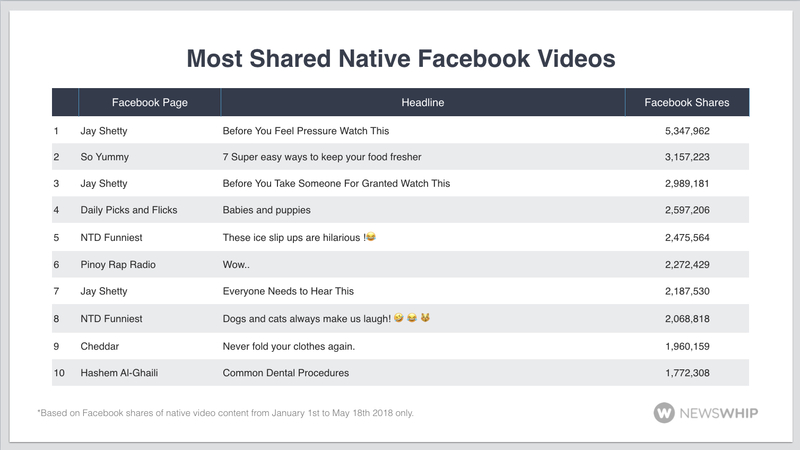 Perhaps surprisingly, “seven of the ten most engaged Facebook video posts in 2018 so far [came] in at three minutes or longer, and the average across the ten [was] three minutes eleven seconds.” Motivational speaker Jay Shetty pops up multiple times in the most popular/most commented/most engaged list, and “the most frequently appearing names were the viral publishers such as NTD Funniest or UNILAD.” Meanwhile, “only a couple [videos] came from what you might call traditional mainstream publishers, with ABC News and Fox News both featuring once in the 100 most engaged Facebook videos.” The closest thing I saw to any news video in any of NewsWhip’s charts was a video from millennial-aimed business video site Cheddar on “how to never fold your clothes again,” featuring a gadget called the FoldiMate. POSTED May 24, 2018, 9:50 a.m.